From the best jobs data in nearly five decades to a re-branded NAFTA agreement to the confirmation of Brett Kavanaugh which clinched a conservative majority on the Supreme Court, President Donald Trump had perhaps his best week as the U.S.’s 45th commander-in-chief. While the major media was fixated on the Kavanaugh drama in D.C., Trump was racking up more wins on the economy, trade and foreign policy as even CNN acknowledge in its postmortem: “President Donald Trump’s winning streak”. Trade: Earlier this week, the Trump administration announced it had reached an agreement with both Mexico and Canada to revise and rebrand the North America Free Trade Agreement as the United States Mexico Canada Agreement. 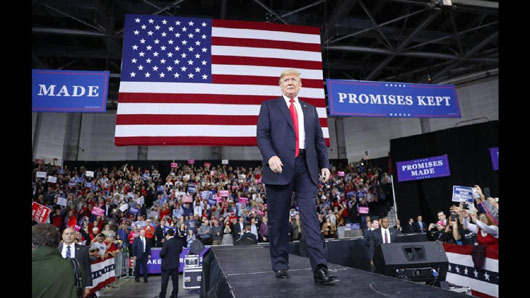 This announcement fulfills one of President Trump’s key pledges on the campaign trail while benefiting constituencies in important states such as Michigan (autos) and Wisconsin and Minnesota (dairy). Trump also renegotiated the Korea Free Trade Agreement and has made progress with the Europeans as well as the Japanese. Economy: The Trump Bump continues, with Friday bringing news that unemployment has reached its lowest level since 1969. Consumer confidence is high, and data from the manufacturing and service sectors indicate continued growth. Foreign policy: With the Oct. 5 announcement of a landmark review of the defense industrial base, Trump has accomplished the “pivot to Asia” that the Obama administration so often talked about. What the pivot looks like is a policy of containment – one that should have been pursued decades ago. Trump has made this move while sanctioning Russia, getting tough on Iran, ending the farcical Middle East “peace process,” and attempting to defuse tensions on the Korean peninsula. Judges: Kavanaugh’s elevation will secure a five-vote majority of originalist and textualist judges on the high court for the first time in modern memory. Such a transformation of the federal judiciary has been a goal of Republican presidents since Ronald Reagan. The fact that it will be Donald J. Trump who will cement this victory is no small feat. On the contrary, it may turn out to be his greatest and longest-lasting achievement.